Since I was a young child, I have always been fascinated with ancient civilisations. When my friends were playing with barbies or reading “Sweet Valley High”, I was pouring over books about the Ancient Egyptians, Romans and Greece. My favourite movies and TV series were about Roman and Greek myths, legends and ancient civilisations like “The Mysterious Cities of Gold“. Visiting Tikal was a dream come true. Unfortunately, we learned the hard way, that your guide can either make or break your experience and ours was a huge disappointment. Caesar, from Little Caesar’s Tours took us on a private tour of the city. He walked us through at such a rapid pace that we hardly had time to stop and take photos (unless it involved the wildlife), not to mention the minimal info on the structures, civilization and history of the site. We got more information on the wildlife than the temples! After Caesar raced us through the city at Olympic Gold Medal speed, we did a little exploring of our own. During that time we got more thorough and fascinating information from eavesdropping on other passing tour guides, than we got during the entire “detailed personalized” tour Caesar supposedly provided for us. Standing at the top of the Temple of Masks, overlooking the Temple of the Grand Jaguar so.many.stairs. 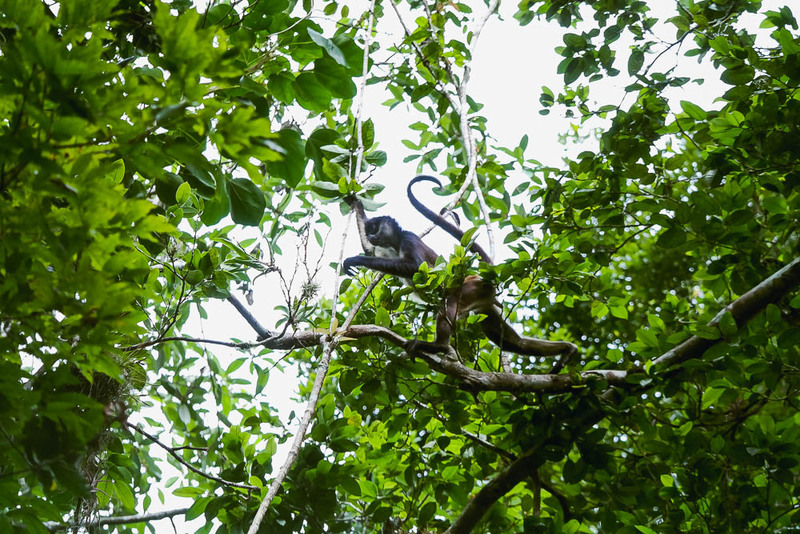 juuuust chillin’ abundance of wildlife in the forest, including toucans and these acrobats!